Wow! It's so hard to believe that this is the final week of the year! 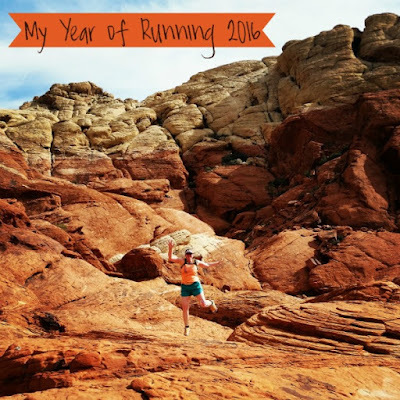 I've been enjoying reflecting on the year and reading lots of other recaps from other running blogs. I'm especially excited to see that the Year of Running is still a thing. It started with Amanda at Miss Zippy (no longer blogging) and is now being hosted by Courtney at Eat Pray Run DC. Without further ado, here is the 2016 edition of My Year of Running. Definitely the Spring Recycled Run half marathon. It was chilly. It was rainy. We missed the start because we ran to Walmart for long-sleeved shirts, but it was the MOST FUN! I ran this with a co-worker because she had casually mentioned to me at the end of 2015 that she wanted to run a half marathon in 2016. I held her to that! In fact, she ended up running two HMs this year. We trained together for this race and weren't about to let the less-than-ideal running conditions get us down. We simply went out there and laughed our way through the two and half hours. It's so hard to decide on one run that was better than all the rest! I had so many great runs while training for the half in April, during the summer RW Run Streak, plus all the other runs. I'm going to go with this trail run I did in July the day before leaving for 2 1/2 weeks in Costa Rica. I felt I could just run and run and run and really had to convince myself to turn around. It just felt so great to be out on the trails all by myself! My Aftershokz bluetooth headphones. I got these free as part of a United Relay / Sweat Pink campaign. I was so excited to try them out! I love that they use bone conduction instead of an earbud right in your ear, so that you still get the ambient noise while out there running. This is a tough one. I don't think I really received any new advice this year. All-in-all though, I think my best advice is always to HAVE FUN! Push yourself. Challenge yourself. Absolutely! But, don't be so focused that it isn't still fun. Oh, geez! This one is even tougher than the previous question. I feel terrible not choosing someone, but I find most of my inspiration from within myself. This is the first one that comes to mind because it's just so silly and fun! I didn't run very many races this year, but I'd love to run Zion Half again. There were some things I didn't like about the race, but the course so gorgeous! I also wouldn't mind a do-over of this race, so that I could do a better job of planning for it and making it more of a vacation weekend - instead of driving the few hours the morning of the race and then heading back to Vegas immediately after I finished. Relaxed and fun! Since I didn't run many races or set many goals this past year, I just spent most of the time enjoying my runs and just running for the fun of it. I'm also linking up today with Marcia, Patty, & Erika for Tuesdays on the Run. I think having fun is the most important part. I think so many runners put pressure on themselves and are disappointed when they do not reach their goals and it take the fun out of it. Just remember why we do this to begin with, because we enjoy it. Running for the fun to it is the best reason to run. Running is my pick me up, so I'd run even if I were never going to run another race. Here's to an awesome 2017! What a great year! The Zion half sounds amazing. 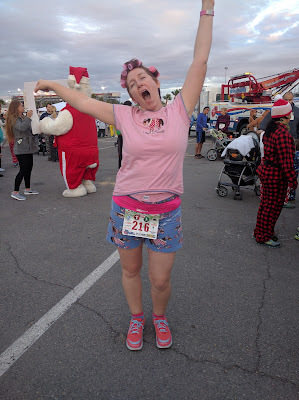 I agree that I didn't get a ton of new running advice this year, and you're right - you gotta remember to have fun! Zion was so amazing. Absolutely gorgeous! Having fun is the best!! Having fun was my new years resolution last year and I think I nailed it! Shouldn't having fun always be the ultimate goal? I think so! Wishing you a super great 2017! Yes, having fun should always be the ultimate. Wait, Miss Zippy stopped blogging?? Wow, I'm super out of the loop! It looks like you had a great year running--here's to more great experiences in 2017!! Amanda might be blogging somewhere else now, but misszippy.com is no longer. Cheers to great experiences in 2017 to you as well. Love that you focused on fun this year - that's always the most important thing, in my mind! And thank you for taking over this end of year linkup! your trail run looks awesome and I got a laugh from your favorite race photo. It looks like you had a great 2016 and all the best to you in 2017! Thanks for stopping by my blog! Having fun is a great way to run (I also would like to toss in injury free too), glad you had a great year.